Add lots of fun to your Halloween party this year with your very own handmade piñata! 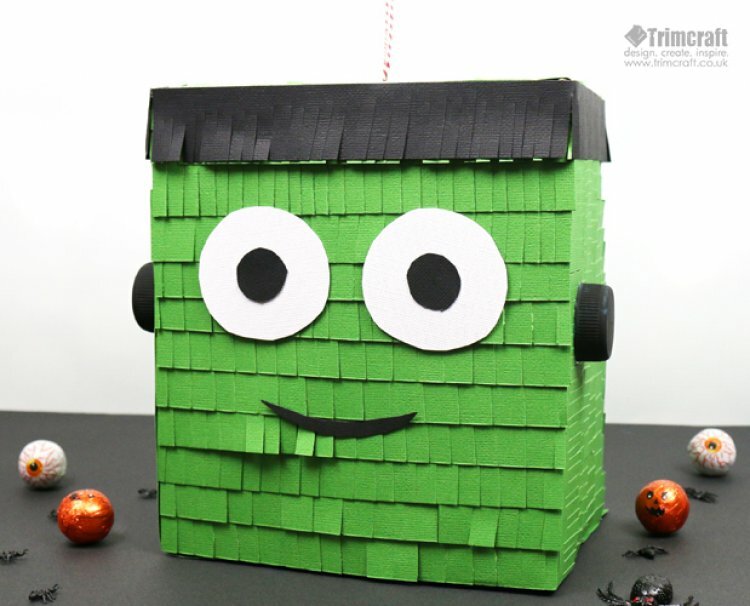 This Frankenstein's Monster face is cute yet creepy - fill it with yummy goodies and you've got a spooktacular activity that doubles as party decor. A perfect kids' craft, this is super easy to make with your little ones, and they will also love getting to the goodies inside! 1. Begin by putting your box together, and before sealing it shut, filling it with your chosen sweets. 2. Next, cut 3cm wide strips of green First Edition Textured card stock. For our box we have used three full sheets but you may need more or less depending on the size of your box. 3. Using a pair of scissors, create a fringe along the length of each strip. 4. Apply double sided tape to the back of your fringed strip and adhere it to the first side of your box. Cover each side of your box until it is completely covered. Ensure when you apply each strip to overlap the previous strip to achieve the textured effect. 5. Once covered, trim the excess off from the edges of your box. 6. Take a black sheet from your First Edition Textured Card Stock pad and cut four strips to fit along the top four edges of your piñata. Fringe one edge on each strip and adhere it with double sided tape to the top of your box to create Frankenstein’s hair. 7. To create the eyes, cut two white circles and two smaller, black circles from your First Edition Textured Card Stock. Glue one black circle in each white circle and stick both to your Frankenstein piñata. 8. Cut a small smiley mouth from the black Textured Card in your First Edition paper pad. Adhere this to your piñata to complete the face design. 9. Cut a length of Dovecraft Twine and tie the two ends. Lift up one length of fringed card and tape your twine to the box, making sure it’s secure enough to hold the weight of the sweets. 10. Paint two plastic bottle tops with Deco Art Chalky Finish Carbon Paint. Once dry, use Dovecraft Ultimate Clear Glue to adhere one to each side of the box to create Frankenstein’s bolts. This design will keep the kids fingers busy and will make a great game for them to play at their Halloween party! Will you make a cute or creepy Frankenstein piñata? We would love to see your spooky crafts so don’t forget to upload them to the inspiration area and to #trimcraft when uploading to social media.